The Witch's Island: A Waste of My Waist(line). What's a girl to do? With the new year just around the corner now, I'm starting to think of resolutions and how I could improve my life and health. A diet is my perrennial favourite. I mean who doesn't think that they could stand to lose a few pounds? But just look at the picture below. Between the presents Hubby brings home from his customers, goodies I make myself and lots of Christmas gifts we have a ton of temptation sitting down in the pantry cupboard. Very tasty temptation. too! 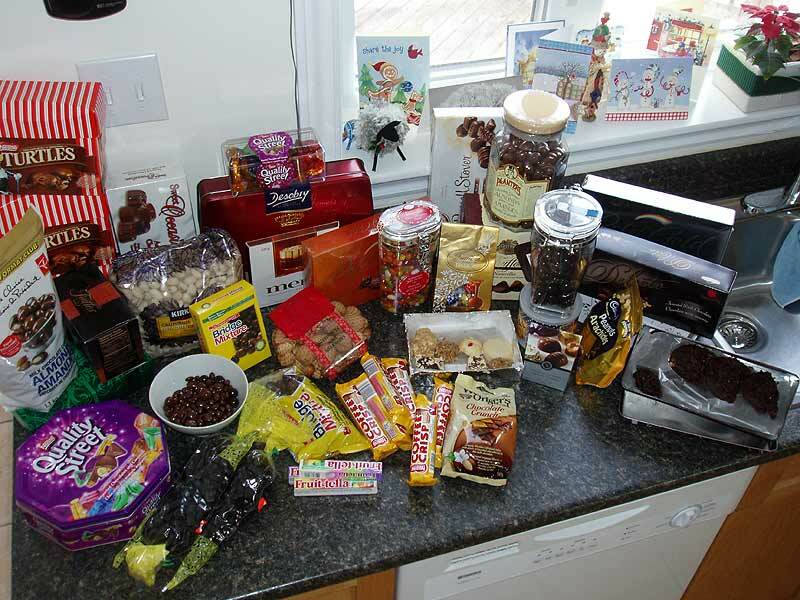 People know all our favourite treats and weaknesses and send us only the best. So it's not like I'm just going to chuck it all out or something but while it's in the house I'm going to be feeling its pull just like a high-calorie black hole in the middle of the house. It's not just me, either. Hubby apparently had half a bowl of Bridge Mixture with his morning coffee before I even got out of bed! How do I resist eating all these goodies? So today we packed it all up into a box and tucked it away in the farthest reaches of the pantry underneath the bottom shelf and in amongst the garbage bags. We did reserve three of the nicest boxes of chocolates to pass out to the friends who are coming over tomorrow evening. Hopefully this won't ruin their diets! I haven't even thought until now about all the Christmas cookies I baked and the Yule Log, what about my Yule Log? I'm clearly going to have to come up with a different resolution this year. I mean was it any more successful last year? Maybe I'll just give up eating tripe and eggplant instead. Yeah, I think I can stick with that one! I zoomed into the pic to look at everything closely and drool. How do the Merci chocolates taste? I wanted to try them but didn't buy any. I received chocolates from my customers too, and my big Toblerone from my mom (it's 750g). We haven't opened the Merci chocolates yet but Hubby had a few at work before Christmas and reports that they are "Mmmmmmmm" good. oh I so know how you feel, and I will be whining on about it shortly on my blog, as I need to lose weight before "the wedding" whenever that may be!! I way over-baked! BUT I have taken so much to other homes that I don't have too too much left. Gosh it's hard though - I have homemade peanut brittle from a student and chocolates that are still unopened. I think I'll borrow your idea and pack it into a box but I'll have to put some heavy duty duct tape around it to slow me down when I have a craving. I'm right there with you!! I mailed goodies out, but made more and don't even get me started about what was brought into the office where I work--I'm already paying the price for my enjoyment of it all. It never does me any good to put things up--I can always manage to reach it!! word verification: DIETR Is someone trying to tell me something??? LOL...yep...you have a problem on your hands...I know what I would do...I'd eat it while running on the treadmill. :)Happy New Years to you and your family!!! This might be a little late since it's Febrary and all...but my daughter's school used to seek donations for the mission, a men's house that might have a meal for them but not desert. It might be an idea to drop off all the temptations to those that might just need a little sweet to brighten their day.